- in commodity markets sellers have never had control of their selling prices! Co-Operatives have long been used to gain the collective voice of various groups such as consumers joining together and work with numbers to gain buying power when purchasing from suppliers - while there have been many Co-Operatives structured on the producer's level, it has always relied heavily on the negotiating skills to gain any advantage. With global trade becoming more competitive in recent times with commodity markets being influenced more by weak financial policy rather than economic sustainability, a major shift has emerged in the inequality across supply and demand trading - for some local commodity markets there has always been huge disadvantages for some and advantages for others but in recent years there has been a shift away from fair trading in global commodity markets, disadvantaging suppliers with prices that offer little to compensate operating costs and ROI. 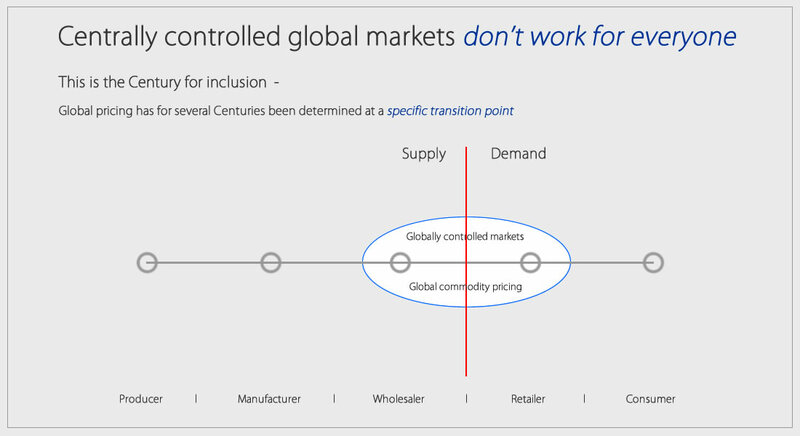 Local markets are linked to global pricing mainly so that produce can move out into the export markets using a common pricing structure, it also means it joins a complex array of variables with trade agreements and subsidies etc. Those variables and global pricing is often unrelated to the local markets especially when a good percentage of produce is for domestic consumption - it's within these variables where Cloudfunding structures the Global Co-Operatives on a global digital platform that is able to bring a global alliance together between grassroots suppliers - Global Co-Operatives operate in an autonomous global economic ecosystem that automatically gives suppliers a defendable competitive advantage to help broaden the collective bargaining power when negotiating with their typical buyers - suppliers in Co-Operatives have the full financial support of the Global Crowd at all times, making negotiating much easier to navigate - as Co-Operatives get established the local communities attach to the Co-Ops, and that's when other Co-Ops get themselves formed to feed off the same connection and the flow begins to move throughout the regions - as local connections begin to spread there becomes a good contagion that flows outwards to other countries with supply and demand and into communities where the Global Crowd gets fully absorbed into providing the productivity momentum. At the opposite end of the Supply Chain is the Buyer Co-Operatives that can help Retailers and local Buyers generate more sales into the economy. All producers and suppliers that have operated in the analogue world can now move to gain the advantages of the digital era and compete fairly across global markets - with the new norm of markets surrendering to the global financial markets needing to find increases in asset prices and commodities to offset huge debts over the next decades, this methodology only leaves profits to be extracted from supply ( suppliers ) to support demand ( investors - rent-seekers demanding ROI ) without global commodity prices even needing to rise to support suppliers ( volatile markets ). Global Co-Operatives provide defendable positions for suppliers, with the value-based market platform having the mechanics to give buyers greater ROI with full Selling Prices, while the Buying Prices are offered to buyers as Price Demand ( e.g. Dairy Industry ), which finds true value-based market demand in the free market model - it's an automatic process that maintains sustainable profits at the local level to build growth and get ROI for suppliers with full Selling Prices that are set by the industry, GPI ( Global Price Index ) or Co-Operatives - Selling Prices are flexible to increase in real-time whenever the global pricing moves above the local Selling Prices - the flexibility eliminates the feast and famine that's often inflicted on producers, while keeping within the spirit of the free market ideology with competitive Buying Prices. Global Co-Operatives are founded on an economic value-based model whereas commodity markets operate purely on a financial model, it's this difference that gives suppliers who have or want to operate as Co-Operatives the backing of the global crowd, which supports the suppliers financially through the globally free DFDCI - Direct Foreign Digital Capital Investment - a free distribution of global productivity wealth that creates more productivity using a democratic global consensus that recalibrates the mechanics to increase the exchange of global commodities - it shifts away from the feudal banking and financial system that has kept the imbalances and inequality in global supply and demand - it make it simple for local sellers to liquidate sales into local currencies at any time for free. A key advantage with OutSell and having DFDCI stimulate the local economy is that there's an immediate effect on local businesses that participate along with Co-Ops by using OutSell to sell their products and services within the same economy - instead of the productivity value going into the banking system and shifting all the effort to generate the value away from the region, the local businesses become the pro-active link between online digital cash and offline local cash when they liquidate their increased sales by Outsourcing the Selling of their inventory for free. Unlike FDI that allows foreign interests to buy out assets and productivity channels, DFDCI doesn't use or transfer costly Capital Investment funds or dilute ownership equity for a price - DFDCI challenges the status quo in commercial Capital Investment by digitally stimulating productivity in any foreign location for free - when most industries fall prey to foreign Capital Investment through lack of productivity DFDCI gives industries and in particular single businesses the opportunity to access free financial support from the global crowd across borders. Implementing FDC and OutSell only needs to begin in a small region like a town where the grassroots suppliers and local businesses usually collaborate together and feed off each other - once inventory is listed for OutSell the whole region comes alive within weeks of trading locally - from there the value-adding organically spreads outwards with other industries and cities adding to the new economies of scale. DFDCI heralds in a new era in global productivity through digital technology by igniting perpetual democratic stimulation between multiple economies ( micro-economics ), it does it in real-time without transferring debt or inflating prices but by specifically focusing on increasing economic growth by generating the velocity of local productivity with free DFDCI - the unique difference what Cloudfunding does is no matter how much DFDCI is directed into any country or regional economy there is no capital flow moving across borders or trade surplus or deficit change ( trade exchange if exported ), only the economic growth in the receiving country is increased via the new productivity - DFDCI taps into the dynamics of multiple global economies and democratically incentivizes the global crowd into directing the free working capital to the economy providing the products and services. Global Co-Operatives can be formed as legal entities in the region where they operate - the economic model in which the Co-Op operates can be mandated to operate for the benefit of all suppliers listed within the Co-Operative's legal constitutional structure. Global Co-Operatives have dual benefits, apart from the negotiating strength there is the customer acquisition and loyalty program that's built on financial independence just like any business entity - the Global Co-Operatives have income streams directed back to the Co-Operative that can build out the business's scale and/or to distribute as income back to suppliers.